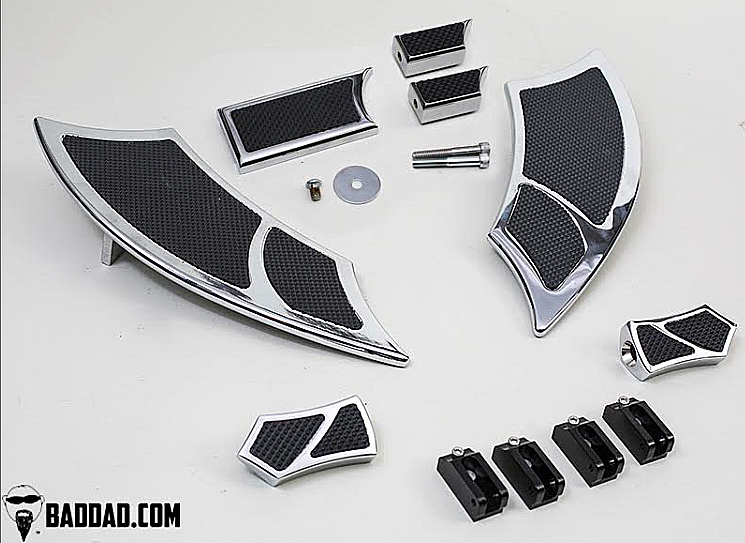 Dramatically improve the look of your custom bagger with Bad Dad's 992 Floorboards and save a few dollars when buying the complete kit. This complete kit includes Driver Floorboards, Passenger Foot Pegs, Brake Pedal, and your choice of Single or Dual Shift Pegs. All mounting hardware is included with this complete package. These custom floorboard components are CNC machined from 6061 aircraft grade billet aluminum and are available in black powdercoat & chrome. Each of Bad Dad's floorboard components are feature a custom cut rubber insert for a great look and comfortable ride. Your order includes all of the appropriate mounting hardware for your Street Glide, Road Glide, Electra Glide, or Road King. Front Floorboards: Boards measure 16-9/16" long, 5-1/4" wide at widest point, and are cut from 1/2" billet. Includes mounting brackets & hardware. Passenger Pegs: The 900 Series Pegs are designed to replace existing passenger pegs and existing highway pegs for Touring & Softail models. If you do not have existing passenger peg mounts or existing highway peg mounts, then you will want to purchase these mounts from your local Harley-Davidson dealer (part number 50208-04). Brake Pedal: This bolt-on brake pedal replaces the original brake pedal (or pad) and bolts directly to your existing brake arm. Includes hardware for installation. Shift Peg: Your kit is available with the option of one or two shift pegs. Each peg includes hardware for installation.